Was that the most entertaining A-League round of all time? 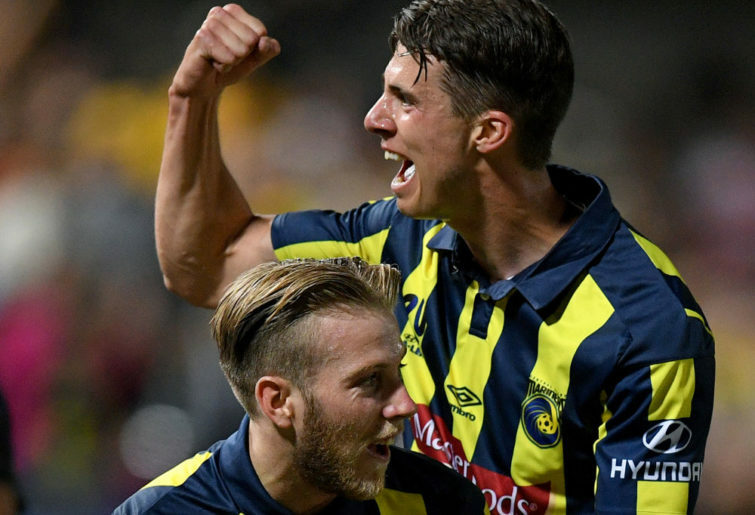 When Andrew Redmayne saved Riley McGree’s penalty at Jubilee Stadium he punctuated one of the most entertaining A-League rounds in recent memory. Who would have thought when Western Sydney Wanderers swapped Redmayne for Vedran Janjetovic things would quite turn out like this? Redmayne has turned into one of the best goalkeepers in the A-League and Janjetovic has turned into, well, Janjetovic. And Redmayne’s third consecutive penalty save went a long way to securing a somewhat laborious 2-0 win for Sydney FC over Melbourne City in what was their final regular-season game at Jubilee Stadium. Was the decision to play games in Kogarah a success? In many ways it was. Another healthy crowd of more than 13,000 fans turned out for the visit of City, as the Sky Blues demonstrated once again that plenty of their fans hail from the southern suburbs of Sydney. But those wondering why Sydney FC don’t permanently move to somewhere like Kogarah don’t quite understand the geography of Sydney – or, for that matter, the whole reason the club exists in the first place. For Sydney FC to move permanently away from the CBD to one of Sydney’s countless geographic enclaves would defeat the purpose of founding a club to represent the whole of the city. Sydney is not Melbourne, and the Sky Blues would cease to be Sydney FC if they moved to a suburb like Kogarah or Leichhardt – they’d be Southern Sydney FC or the Inner West Hipsters or whatever. That’s probably an important distinction to make given the sheer volume of fans who have commented online – typically from outside Sydney – that the Sky Blues should simply move to Kogarah permanently. Redmayne’s penalty save aside, Sydney FC weren’t overly impressive downing a Melbourne City side that once again lacked a cutting edge up front. But who really cares about that game when Saturday’s fixtures were three of the most entertaining we’ve seen in the A-League in ages? Where do we even start? Probably with Andrew Hoole’s spectacular double against Melbourne Victory in Gosford. If they’d been scored in the English Premier League, we’d been fawning all over Hoole and proclaiming him one of the finest free-kick exponents of our time. But one of the biggest problems the A-League has had for a long time now is convincing anyone that there is genuine quality to be found in our stadiums. It’s a shame the Mariners couldn’t hold on – unless you’re a Victory fan of course – but even they didn’t endure the most spectacular meltdown of the weekend. That honour of course belongs to Brisbane Roar, who somehow turned a 3-0 lead with a one-man advantage into a 4-3 defeat come the full-time whistle. And if you want to talk about coach killers, it was Dane Ingham’s second yellow for kicking the ball away that completely changed the complexion of the match. Mind you, Jamie Young almost decapitating Craig Goodwin didn’t help, and the Roar custodian might find himself set for a decent stint on the sidelines following his dismissal. Adelaide still had to produce the quality to make their unexpected one-man advantage count, and they did that and then some when Nikola Mileusnic headed home the most ridiculous of winners in the seventh minute of stoppage time. Yes, some of the officiating during the game was questionable and it certainly wasn’t exactly a stellar defensive display from either team, but how good was that climax? Oh yeah, and Andy Keogh’s daisy-cutter in Perth Glory’s 3-0 win over Wellington Phoenix may just have been the most aesthetically pleasing goal of the round. The problem with the A-League is not its quality – save for the odd stinker here and there – and it honestly never has been. The issue for a long time now has been trying to convince those who have written the competition off to give it a chance.